Chicken Salad is one of those things I had no idea I liked - until a few weeks ago when my boss told me I would. I happen to work for a local office where the head of the office is also an amazing cook! After two years there I've pretty much come to the point where every now again I'll say "can you order it how you get it?" Or "what should I get". She never fails - it's always delicious. AND, she makes some of the most amazing sandwiches, and THE BEST tuna fish I've EVER had. 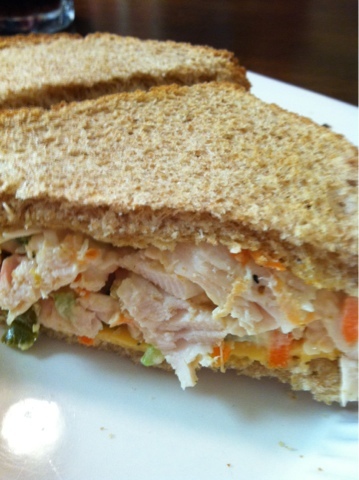 We order regularly from a local place that had some Chicken Salad Club Sandwiches that are TO DIE for. Toasted bread, lettuce, cheese, chicken salad - and we add hard boiled egg to them - because my boss said to - and again, it makes them even better. Chicken salad doesn't SEEM very complicated. Of course, this is me - I could complicate the simplest of things and make them sound like brain surgery. 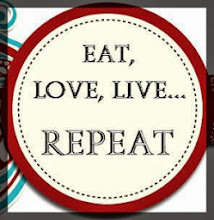 So, to the "Eat, Love, Live....Repeat" official Facebook page we go for suggestions - which I got several! I measured nothing, just put a bit in at a time until I got it how I wanted it. Them I toasted some whole wheat bread, put a slice of American cheese on there and voila!! Just for the record, my jalapeños didn't make it spicy at all. So there we go, one more cooking (or mixing in this case) accomplishment. I could get really used to this Suzy homemaker routine! Don't forget to check me out on Facebook and give a like, and as always, comments and suggestions are welcome!